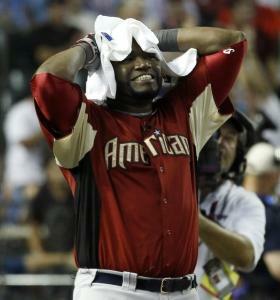 PHOENIX - The Home Run Derby came down to the Red Sox against the Yankees. Robinson Cano won this chapter of the great rivalry, edging Adrian Gonzalez at Chase Field last night. Gonzalez went first and tied the final-round record with 11. But Cano responded by going one better to claim his first title in the event. Gonzalez first tried the Derby in 2009 and was eliminated in the first round, hitting two. But this time he put on a show, slugging 31 on the night. But that was not enough to top Cano. In the final round, Gonzalez hit five consecutive home runs at one point. But his final four swings produced outs as he seemed to run out of gas. The competition lasted more than three hours. Cano made outs on two of his first three swings in the final round, but then he started to connect, drilling seven homers in his next nine swings. Cano took a timeout after hitting his 11th, then walked to the plate. His next swing won it as the American League team rejoiced. Cano had his father, 49-year-old Jose Cano, pitching to him. The elder Cano spent eight seasons in pro ball, appearing in six games for the Houston Astros in 1989. Father and son embraced after his victory. Gonzalez had Indians manager Manny Acta throw to him. Gonzalez, Cano, David Ortiz, and Prince Fielder of the Brewers advanced to the second round of the eight-man competition. Gonzalez hit 11 to advance to the final, giving him 20 in the first two rounds. Cano also hit 20, 12 coming in the second round. Ortiz, the defending champion, finished with nine, as did Fielder. The nine homers gave Ortiz a career event total of 77, breaking the record of 74 held by Ken Griffey Jr.
Toronto slugger Jose Bautista, the major league leader with 31 homers at the break, had only four in the first round. But that was better than Milwaukee’s Rickie Weeks (three) and Matt Kemp of the Dodgers (two). The event included a team competition for the first time, with the AL winning easily, 76-19. Lester optimistic Jon Lester, a late addition to the AL roster for tonight’s All-Star Game, cannot pitch because of a strained left lat muscle that landed him on the disabled list. But the Sox lefthander elected to attend the game anyway, deciding the experience would be fun to share with wife Farrah and 1-year-old son Hudson. As for his injury, Lester is very optimistic. Lester had an examination Sunday and checked out well. He will join the Sox in Tampa Thursday and hopes to start playing catch then. He already has returned to some weightlifting exercises. “We want to make sure that when I throw, there aren’t any setbacks,’’ he said. Lester is eligible to come off the disabled list July 22. He said he hopes to return on or close to that day. The key, he said, would be being healthy enough to pitch in the bullpen a few times leading up to that. If called, he’ll serve Sox righthander Josh Beckett, who hyperextended his left knee Friday, told American League manager Ron Washington that he is ready to go. Beckett said his knee feels fine. He is scheduled to face Tampa Bay Sunday night. Andrew Miller and John Lackey are scheduled to start the first two games of the series. Crystal ball gazing Giants closer Brian Wilson, the pride of Londonderry, N.H., is predicting a San Francisco-Boston World Series. Wilson said he watched the Junior Pan-American Games at Fenway when he was 13 and some Yankees-Red Sox games along the way. “I had a chance in 2007 [with the Giants], I thought, but I didn’t make the team and the chance went away,’’ he said. Beltran would fit As the July 31 non-waiver trade deadline creeps closer, right field is a glaring need for the Red Sox. They are getting an OPS of .638 from that position, the second-lowest in baseball. Carlos Beltran of the Mets would fill that need nicely. The switch-hitter is hitting .285 with 13 home runs, 28 doubles, and 58 RBIs. But there are obstacles. Beltran, who will be a free agent after the season, currently has $8.1 million remaining on his contract and has a full no-trade clause. Poised to produce Dodgers outfielder Andre Ethier is expecting big things down the stretch from Red Sox second baseman Dustin Pedroia, one of his best friends and a former teammate at Arizona State. Pedroia is hitting a solid .284 with 11 homers and 44 RBIs, but that is well below his usual production. “He’s a great player,’’ Ethier said. “I think he’s had a good year even up to this point. He’s coming back from a tough injury. I saw firsthand all winter, the steps and stuff he had to do just to get back to the point he’s at right now. What about the idea of Ethier playing with Pedroia again? Pimentel demoted The Red Sox have demoted righthander Stolmy Pimentel from Double A Portland to Single A Salem. Pimentel, considered one of the team’s better prospects at the start of the season, was 0-9 with a 9.12 ERA in 15 starts for Portland . . . Derek Jeter, voted onto the AL team by the fans, pulled out citing an injury, then decided not to attend at all. “It’s good to be here,’’ said Mets shortstop Jose Reyes, who is injured but elected to attend. “I like it. As a baseball player, you want to be in the All-Star Game. You have to understand Jeter. He’s coming back from an injury and it’s good for him to take a break.’’ . . . Yankees third baseman Alex Rodriguez, one of many All-Star selections out because of injury, had surgery in Miami to repair a torn meniscus in his right knee. He’s expected to miss 4-6 weeks. Globe 10.0 Is the HR derby a sporting event?